‘Ahihi-Kina‘u: Established in 1973, ‘Ahihi-Kina‘u was the first reserve in the Natural Area Reserve System and as such is the anchor gem in a priceless statewide system. 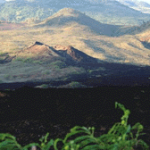 Hot, dry, and sparsely vegetated, the reserve is unique in that its boundaries contain the most recent ‘a‘a lava flow on Maui, here on the dry south flank of Haleakala. Unlike most NARs, ‘Ahihi-Kina‘u also includes a marine component–the surrounding reef systems shelter a complex assemblage of organisms, most of them endemic to the Hawaiian archipelago. Fragile and imperiled anchialine pools, housing a high diversity of rare Hawaiian shrimps, are protected within this Reserve and are off-limits for their own protection. Coastal dry shrublands, coastal mesic boulder beach communities, and examples of pioneer vegetation also serve as habitats for other rare native plants and animals–primarily insects and birds. Hanawi: This reserve is located on the wet slopes on the north flank of Haleakala. It contains a rare subalpine grassland as well as montane and lowland semi-wet and wet grasslands and forests. Rare plants and endangered birds are also protected by this reserve. Kanaio is located in rough lava terrain on the southeast slope of Haleakala. The reserve protects a remnant of the native dryland forest that once covered the leeward slope of Haleakala. Kanaio protects a rich assemblage of native dryland trees and shrubs. West Maui: The reserve encompasses lowland and montane native communities ranging from dry grasslands to wet ‘ohi‘a forests. The reserve also includes bogs, montane lakes, forest bird habitat, and rare and endangered plants. The areas are extremely important watershed sites which contain the headwaters of perennial streams. 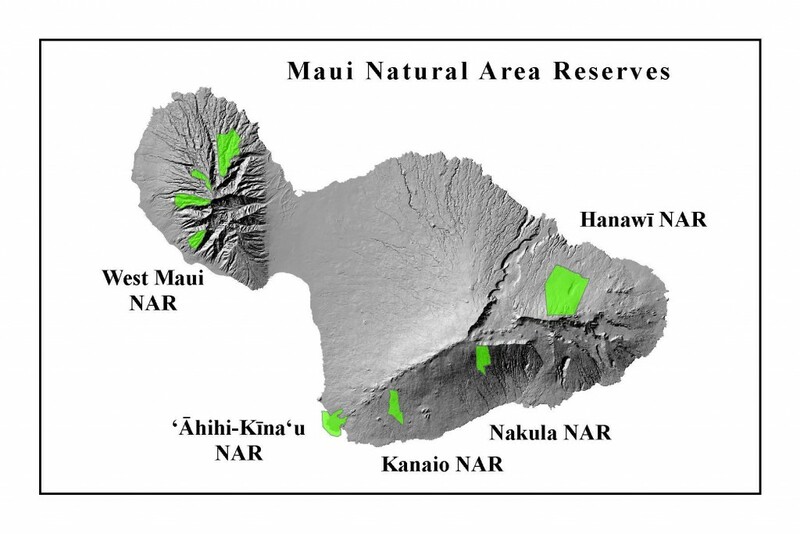 This reserve is made up of four non-contiguous sections: Honokowai, Kahakuloa, Panaewa, and Lihau. Nakula: This reserve contains a rare leeward koa-‘ohi‘a forest and alpine shrublands on the south slope of Haleakala. The reserve is potential reintroduction site for endangered birds.